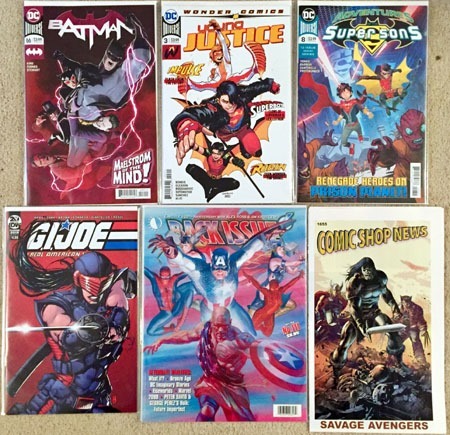 This was another small-ish week for new comics–single issues, anyway. But a much bigger week with other stuff! The week has the new issue of Batman with #66, resuming Tom King‘s run after the 2-issue Flash crossover. We’re "already" at the 3rd issue of Young Justice (time’s flying!). And we’re now 2/3 through this 12-issue Super Sons series. On strength of Hama‘s stuff and the longevity of the series, I opted to also snag this GI Joe Yearbook issue rather than try to hunt it down later. And though I had not planned on it for the week, the new issue of Back Issue was out, and had my attention from the Alex Ross Earth X cover.Though I somehow have not managed to finish previous issues, I can attest to the strength and value of this magazine, that I’ve quite enjoyed issues I’ve managed to get! I’m not sure what to think of the notion, even, of Savage Avengers…but that’s what Comic Shop News chooses to spotlight this week. 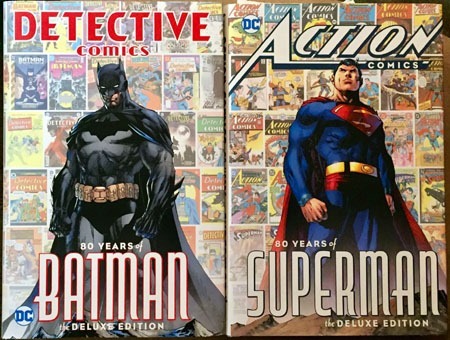 As new comics stuff at the comic shop goes, though, the real gem for me is the Detective Comics: 80 Years of Batman Deluxe Edition. Much like last year’s Action Comics: 80 Years of Superman Deluxe Edition, this is a huge volume with a number of stories from throughout the history of the title, and I love that the trade dress was maintained to make the two books visually quite complimentary! 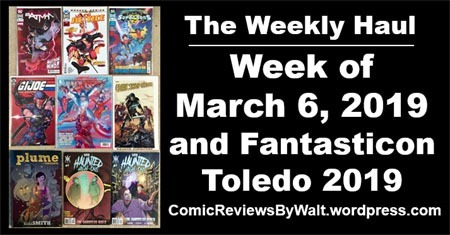 Along with new comics, this week also had a couple of conventions. Wizard World: Cleveland was held this weekend (I live close enough that if you’re not local, I can claim "Cleveland-area" geographically). However, where I’d’ve adored having a local Wizard World show 15, 20, definitely 25 years ago, I haven’t yet been to a Cleveland iteration. Admission is just too high, with too many extra/hidden "fees" and such tacked on to manipulate the actual price, and too few comics dealers and comics-related things for me to justify the massive expense! That said…I attended Fantasticon in Toledo, Ohio, with a couple of friends, and had quite a good time of it! And the admission price for that convention was under $10–I’m pretty sure a good 75% cheaper than WW and probably more comics in the room! 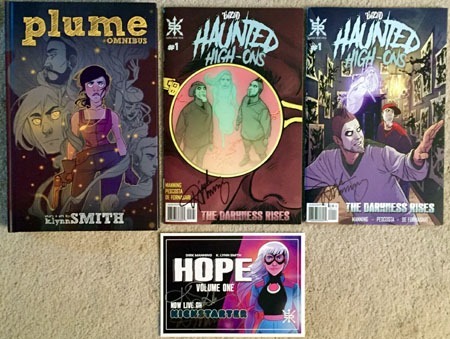 Going into the con, my two main "goals" were to pick up the Plume Omnibus by K. Lynn Smith, as well as the new issue of Haunted High-Ons from Dirk Manning. As it worked out…that was a complete success! Manning has got to be one of the most personable, friendly creators I’ve ever met, and he’s honestly been "the" draw for me with several shows (or at least the deciding factor). And through his work, I’ve "discovered" Smith, as well as a number of others. But while I couldn’t justify the omnibus the last time I was at an appearance, this time I went in with it as the #1 thing on my list. 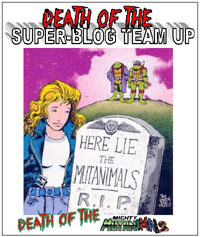 Manning has become a definite "exception" in my eyes–akin to my TMNT "exception"–such as my willingness to purchase a variant cover, or to find enjoyment in some "exclusive edition" of something. The creators have a joint project in Hope, the first issue having been out in an early edition last year, and getting a wide, improved release this upcoming May for Free Comic Book Day. And they’ve (as of this writing) got a Kickstarter project that’s already fully-funded (so if you "back" it, it’s basically a "given" that you’re getting the book, no coming down to the wire and wondering if the thing will squeak across a fundling goal). I’m quite judicious in my opting to back any such projects…but this was one I backed immediately. It’s for a collected edition of the first six issues of Hope, and though it’s not due til sometime next year, I’m happy to pay for it now and know it’ll be coming! The convention was a bit less successful in terms of other comics. 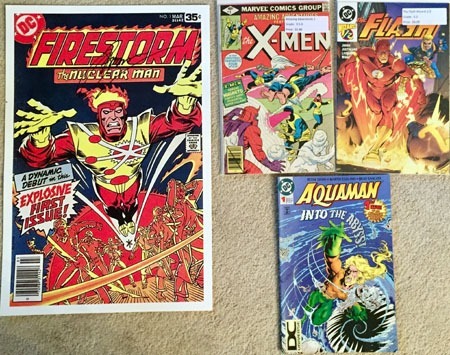 I did get a print of this Firestorm cover from (and signed by) Gerry Conway. I found the Amazing Adventures issue and the Flash #1/2 in a 50%-off-marked-prices bin (so, cheaper than any contemporary new comic!). And for the heckuvit at another booth, saw this Aquaman #1 for $1, and decided to go for broke and buy it. At another booth, I came across this Rafiki with Simba Pop vinyl figure. I’d seen this at Toys R Us back in 2016, I think, maybe earlier, maybe later–but obviously some time prior to the chain’s closure. And I couldn’t find it again after that, so when I saw it for a "standard" price (as opposed to some jacked-up stupid price) I went ahead and got it. 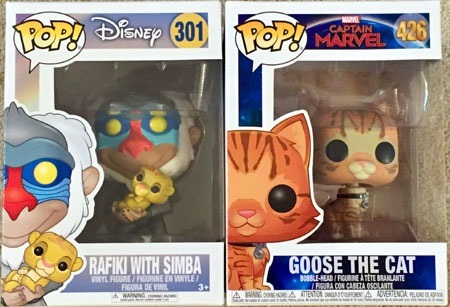 At a Gamestop after the convention, saw some Captain Marvel Pop figures and remarked to my friend that if they had Goose the Cat I’d probably get it. Well, she had a keener eye than I did, and long story short…I got the figure. I’d hoped with it being a bit smaller it MIGHT be an "exception" to the "all-Marvel Pops are bobble-heads" but unfortunately that’s not the case. I’d be interested in a lot more of the Marvel figures if they were NOT bobbles..! As another not-exactly-the-convention purchase, someone had a small table set up selling Girl Scout Cookies, so I snagged a couple boxes, as I missed out last year, and possibly the year before. And I’d had another toy arrive that I’d ordered the week before…and which will likely be detailed in an upcoming post. But including that, and some other stuff, it’s been an incredibly expensive couple weeks.